Computer hard drives are one of the simpler parts to pick for your gaming PC build but there are perhaps still a couple things you may wish to know about them. In this guide we'll cover the basics including a bit about how they work, what RPM and cache is, what size to get for a gaming rig, and which brands are best in 2018. Let's get straight into perhaps the shortest hardware guide on the site. The hard drive (HDD: Hard Disk Drive) is where all your files, programs, and of course your favorite games are stored. It'll also be where you install your operating system should you only be using the one drive; if you're also getting a Solid State Drive then you'll want to install your OS on there instead. How do they work in a nutshell? Hard drives store information by manipulating magnetic fields over the moving surface of a disk coated with a magnetic material. This use of magnetism to store information is very similar to how tape or video recorders work. Each individual disk inside a hard drive is called a platter. Large hard drives contain several platters and use both sides of each platter for storage. The drive contains a motor that spins the platters at speeds from 5400 to 15,000 rotations per minute (RPM). What is RPM on a Hard Drive? Is it Important? Hard drives have spinning discs inside of them, and the faster they spin the faster you can access and transfer data. The RPM of a hard drive is the spec that measures its speed, which stands for Revolutions Per Minute. What's a good RPM? 7200rpm or above is ideal, but if you get a 5400rpm it's not the end of the world, especially if you use an SSD for your key, frequently-used programs. But when buying a HDD do shoot for 7200rpm if at all possible. We always include 7200rpm hard drives in our best gaming PC builds of the month as we would personally never buy a 5400rpm HDD (but some people won't mind them). What is Cache Memory on a Hard Drive? 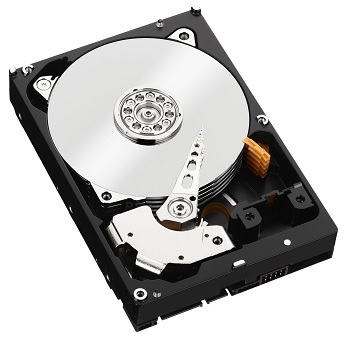 Hard drives usually come with extra cache memory built into the drive for even faster loading. Drives with 32MB or even 64MB of cache is ideal for maximum performance, but you don't need huge amounts of cache memory in reality, and picking a hard drive with less cache memory such as 8MB or 16MB is fine. What Size HDD Should You Get for a Gaming PC? Now to what you're probably wondering when picking the right HDD - what size is good? Of course it'll depend on your particular needs, but if in doubt and you don't think your needs are any higher than the typical gamer and PC user then 1TB is a good place to start as it's not too small and not too big (read: good value for money). Although 2TB HDDs aren't usually all that much more so consider one of those instead. But yeah, I'll stick my neck out and say that for most gamers 1TB will serve you well. Plus, you can always add a secondary (internal or external) hard drive later on should you want more storage. Which HDD Brand is Most Reliable in 2018? Hard drives do fail at times, so if you want to buy the best hard drive for your gaming PC then stick to trusted brands like Western Digital, Seagate, Toshiba and Hitachi which have the lowest failure rates in the industry in general. Personally, I always stick to the first 2 names mentioned when building or upgrading a PC.